Based on the novel by Tomihiko Morimi, published in December 2004. Yojouhan Shinwa Taikei won the grand prize for the animation category in the Japan Media Arts Festival on December 8, 2010. ~Multilingual review, English & Español: The Tatami Galaxy~. Life wouldn't be less than a simple and plain matter of choices, wherever our life is right now is due to the choices we've made in the past, we're doing and we'll probably make in the future, considering everything said "Life" would just be an abbreviation of the sum of choices we've made up until now. Have you ever thought about them?, the choices you've made I mean, I’m pretty sure everyone have dedicated, at least a little moment of their time, to muse about the choices we've made so far in our lives, important or mundane ones, it matters not. The best moment would be maybe while we're spacing out during a boring lesson in our classroom or when we're just slacking off a bit at our working place, or if our personality is that of the "pensive" type we already have a space in our schedule to muse about the little events in our lives, leaving aside the type of personality we've, I'm pretty sure we do all have asked ourselves the unavoidable question "What if..." didn't we?. "Maybe I should have seated next to that pretty girl in the bus, but instead I’ve decided to stand up". Just an example, how can my life change due to that mundane and maybe insignificant event?, impossible to know it and for that I question myself now "What if I’ve seated with that girl? ", a quick reply to that question could be, even if it’s a little creative, that I could have talked with her a little during the ridesharing, I could have found that she's a wonderful girl and she thinks nice of me, next day she could have reserved the sit for me and again we start to talk, this could have lead me to ask her out, to fall in love, get engaged and when I didn't even realize it I've already married that girl. What was the triggering event for that?, "a stupid and mundane choice when I was young" would be the answer of an older version of myself, or maybe, a more realistic scenery would be that the girl gets off of that bus and it was the last time I saw her, anyway it wouldn't be completely wrong to say that we're the product of our choices, but not only, since also the people we meet have the power to change us considerably; maybe you're asking "what does all this things have to do with the review and with this anime?" to that I reply "quite everything", since "we're the product of our Choices" is the main theme of the anime I'm now going to introduce you, The Tatami Galaxy. Throughout the development of the story, we can see how different can be the life of The Protagonist based on the choices he had made and the people he had meet during his first year of University. The premise of this anime is to show us how different could be our lives due to a choice, in our protagonist's case, the choice of a Club to join. How can the choice of joining a certain Club be considered as something important, something that could change completely our lives?, at a first gaze I would say “it’s quite improbable" but I couldn't be more wrong and for our protagonist that couldn't be more true. The Cinema Club?, Tennis Club?, Softball Club?, English Club?, it doesn't matter; all of this show is about The Protagonist's pursuit of his “rose-colored campus life” and what would be that? well it's Everyone's dream: being popular, a lot of friends and a cute girlfriend but that's something that reveals to be a particulary difficult goal to reach for our timid protagonist and lucky isn't even by his side since someone is obstructing him and that obstruction it's represented by a physical person, another character of this anime, Ozu. The relation between Ozu and The Protagonist is a bit weird but I totally loved it, Ozu could be or your best friend or you worst enemy, depending how you approach him. So through many of the clubs The Protagonist joins we're the audience of what would happen to his life if he had only joined a different club in his first year. The story telling of this anime is unique, incredible unique if I must say it. We need to think of it as a puzzle, a puzzle with 11 parts (11 as the episodes of this anime), so little by little we need to fill the missing parts until it gets finished, at that moment we can actually gaze the wonderfully picture that have been created. The first thing that strike us are the characters, they're unique in their own way, all of them have a characteristic that would lead them to being crafted into our minds, starting from The Protagonist to the Fortune Teller (you'll love that old baba!) since they are made of a simplicity and yet they're so unique that you'll have a hard time trying to get them off your head (admitted if you want to). First we have The Protagonist, he's a first year University student, quite shy and easily manipulated by the other characters of this show, especially Ozu, whose failing to obtain his precious rose colored life consider his life a total waste. Ozu, whose The Protagonist usually describe his first meet with him as "the first as well as worst", he's a devil like little guy but not only because of his behavior which is indeed evil ("He eats people's unhappiness with three helpings of rice" - The Protagonist's words) but also because of his appearance, he's also the best and only friend of our protagonist. These two are the most important characters in the show, I won't talk about each of them since Tatami Galaxy's really offer a large and above all, original and interesting cast of characters, otherwise this review could get really long. Even if the story revolves around The Protagonist, the other characters aren't less important, I would say actually they're more important than him for the development since our protagonist is a passive character; Remember?...not only the choices are important but also the people we meet could lead our lives to an unexpected turn. This anime goes that far too actually made us understand that not experiencing something is actually an experience itself, and we won't understand that until we finish this anime. The ending is something special; it gives the whole meaning for this show. Comedy isn't missing neither, this show stands out also for its comedy scenes, and every character will make you laugh in a different way, their own way. Johnny' scenes, a character's show, are memorable. The art is quite particular too, even if you may find it weird at the first sight, we get used to it quite fast and maybe we ask ourselves "Why there aren't more shows like this?”, The animation is Madhouse Studio, so we can count with an incredible high level animation, characteristic trademark of this studio. The OST suited perfectly every scene, from those more " lively" ones to those passives, but for one strange reason we don't give the deserved attention to them, that’s because The Protagonist's speed light monologues will take most of our concentration, leaving the OST in the background, which is not necessarily a bad thing. Both OP/ED are amazing too, I especially liked more the OP single. Unless you're able to read very quickly you won't be able to leave the Pause button aside, since The Protagonist usually talks in a very speedy way that sometimes we aren't able to read the subtitles in time but that won't be the only thing to interrupt us during the vision of this anime, there are also those The Protagonist's monologues which are so filled with meaning and extremely well written that we could actually feel the urgent of going back to rewatch them, an action I actually repeat many times. It’s incredible but every single phrase pronounced in this show has its own charming and filled with meaning, Wikiquote would have a lot of pages filled with our characters phrases, and I'm not referring to those cliché ones we find everywhere, Tatami Galaxy's ones are all original. 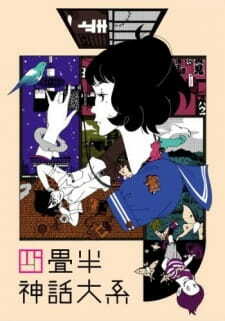 There are anime with meaning and moral, there are anime with funny characters, there are anime with an incredible story and unique storytelling, but I need to say that The Tatami Galaxy was composed by all of them. I would recommend (personal experience) to rewatch this anime after some time, because its incredible the amount of particulars that could be missed the first time, after all, re-watching an anime to us dear let us appreciate those little particulars we could have missed the first time, and in The Tatami Galaxy's case I can assure you'll be surprised. I've expressed myself the best I could, I hope this review moves someone into watching this anime because it’s really worth. I'm going to leave you, the readers, to visualize the whole bocón of things said in this review, don't hesitate and jump into it you won’t regret it, in that case I’ve realized my main point for this review, otherwise I apologize for being unable to send my feelings towards this incredible anime to you since it's only my fault as a novice reviewer as I'm. La Vida se reduce a las decisiones tomadas. Cualquiera sea el modo en que esté nuestra vida ahora, se debe exclusivamente a las decisiones que hemos hecho en el pasado. Lo que nos lleva a decir que no estaríamos del todo en error al decir que la Vida no es nada más que la suma de nuestras decisiones. Personalmente soy una persona que no cree en el Destino, pues me gusta pensar que tenemos el control total de nuestras vidas, el control de las decisiones que tendremos que afrontar. Me gusta pensar que tenemos frente a nosotros una cantidad infinita de puertas en vez de una sola. ¿Alguna vez has pensado en ellas, las decisiones que has tomado? Estoy seguro que cualquiera ha dedicado, aunque sea un poco de tiempo, para meditar sobre ellas. Importantes o no, el mejor momento para ello podría ser cuando estamos ociando durante una lección aburrida en la escuela, o mientras ociamos un poco en el trabajo o, si somos del tipo pensativo, no necesitamos estar aburridos para dedicar un poco de nuestro tiempo a meditar sobre todo. Estoy seguro que al menos una vez nos hemos preguntado "¿Cómo sería si..?". "Tal vez debería haberme sentado al lado de esa chica, pero decidí quedarme de pie"
Es sólo un ejemplo, ¿cómo cambiaría mi vida debido a ese evento tan común y corriente?. No soy capaz de saberlo y por eso si me pregunto "¿y si me hubiese sentado con ella?" una respuesta veloz, aunque un poco creativa, sería que habría comenzado a charlar con ella y me daría cuenta que es una chica estupenda y de que, sorprendentement,e ella piensa lo mismo sobre mí. Al día siguiente me la encuentro de nuevo y comenzamos a charlar otra vez, y esto me lleva a pedirle un día de salir conmigo, a enamorarme de ella y así sucesivamente al matrimonio. ¿Cuál sería el evento que me llevó a todo eso? "Una decisión común y corriente cuando era joven" sería la respuesta de mi Yo anciano o, siendo más realista, la chica se baja del tren y esa fue la última vez que la vi. No estaríamos del todo errados al decir que nosotros somos el producto de decisiones, pero no solamente nuestras decisiones, pues las personas que encontramos a lo largo de nuestro camino tienen el increíble poder de cambiarnos…Tal vez os estés preguntado "¿Qué tiene que ver todo esto con la review o con el anime?" y a eso le respondo: "prácticamente todo", porque "Somos el producto de nuestras decisiones" es el tema principal de la serie que ahora les voy a presentar, The Tatami Galaxy. A lo largo del desarrollo de la historia, podremos ver como sería la vida de nuestro protagonista en base a las decisiones que escoge el primer año de universidad y a las personas que encuentra en ella. La premisa de esta historia es mostrarnos cuan diferente pueden ser nuestras vidas debido a una decisión que tomamos. En el caso de nuestro protagonista, la decisión de un Club al cual unirse. ¿Cómo podría revelarse ser una decisión que cambiaría nuestras vidas el escoger a cuál club pertenecer? Es algo que consideré imposible a una primera impresión, algo que se puede considerar una deducción completamente errónea después. ¿El Club de Cine? ¿Club de Tenis?, ¿Football Club? ¿El Club de Ingles? No tendría importancia de verdad pues el objetivo de nuestro protagonista es encontrar lo que él considera "La vida color rosa". ¿De qué se trata esta? Pues eso sería el sueño de todo el mundo: Ser popular, muchos amigos y una bella novia, algo que, claramente, para nuestro tímido protagonista se revela ser una misión imposible. Ni siquiera la buena suerte lo acompaña, pues se encuentra siempre siendo obstaculizado. El obstáculo en este caso es una persona física, otro personaje de este anime, mi favorito, Ozu. La relación entre Ozu y El Protagonista es una de las más geniales que he visto. Fuera de lo normal, pero algo que completamente amé. Ozu o podría ser tu mejor amigo o tu peor enemigo, depende de cómo te le acerques en vuestro primer encuentro. Entonces, a lo largo de este anime, nosotros seremos los espectadores de cómo seria la vida de nuestro pobre protagonista, y cómo esta sería diferente si sólo se hubiera unido a otro club su primer año. La narración de esta historia es única, increíblemente única si tengo que precisar. Si queremos podemos pensar de esta como un rompecabezas: un rompecabezas de 11 piezas (11 como los episodios de este anime) que poco a poco va cogiendo forma, sólo colocando la última pieza es que podremos apreciar la imagen completa y admirarla es todo su esplendor. La primera cosa que nos impactará en esta serie serían sus personajes, los cuales son únicos en su forma de ser, hasta dejar una huella en nuestras mentes que difícilmente desaparecerá. Comenzando por El Protagonista hasta la Vieja Adivina (¡Adorarás a esa vieja! ), todos son tan simples, pero a la vez son tan únicos que difícilmente los encontrarás aburridos. Primero que todo tenemos a nuestro protagonista, un chico bastante tímido y reservado fácilmente manipulable por otros, especialmente Ozu, el cual al haber fallado en su búsqueda por la "vida color rosa" siente que su vida hasta ahora ha sido un completo desperdicio. Después tenemos a Ozu, sl cual el protagonista suele describir su primer encuentro con el como "el primero al igual que el peor". Él es un chicho malévolo, y no sólo por su comportamiento ("Él se come la infelicidad de la gente con un contorno de arroz" palabras de nuestro protagonista), sino también por su apariencia que, es de hecho, demoníaca. Estos dos son los personajes más importantes del show. No me pondré a hablar sobre los demás porque Tatami Galaxy ofrece un cast de personajes muy amplio, pero, sobre todo, interesante y original, lo cual me tomaría mucho tiempo y esta review se pondría muy larga. Si bien la historia gira entorno a El Protagonista, los otros personajes no son menos notables. Yo diría que son hasta más importantes para el desarrollo de la historia que el propio protagonista, debido a que este último es un personaje pasivo, ¿Recuerdas?... No sólo las decisiones son importantes, porque también están las personajes las cuales le pueden dar un gran giro inesperado a nuestras vidas. Este anime llega tan lejos tanto da mostrarnos que no experimentar algo es una experiencia en sí y eso no lo llegaremos a comprender hasta el final de este anime. El final es algo especial, algo que le da todo un significado a la experiencia que hemos visto. La comedia no falta, de hecho este anime resalta sobretodo por su comedia, cada personaje te hará reír en un modo diferente, el modo de cada uno de ellos. Las partes de Johnny, un personaje del show, son memorables. Los diseños son bastantes particulares también. Aunque se pueden encontrar extravagantes en principio, nos acostumbramos de una manera veloz a ellos, a tal modo que nos preguntamos "¿Por qué no hay más como estos?". La animación está hecha por el estudio Madhouse, famoso por la atención y la extrema precisión en sus trabajos. Es de verdad muy fluida y perfecta. El OST encaja perfectamente en cada escena de la serie, desde las más pasivas hasta las más activas. , un particular extraño es que por la mayor parte el OST pasa desapercibido, debido a que los monólogos a la velocidad de la luz de nuestro protagonista se llevan la mayor parte de nuestra atención, dejando el OST en un plano fuera de nuestra percepción, lo cual no es necesariamente algo malo. OP/ED fueron muy buenos, a mí me gustó mucho más el OP single. Si tu capacidad de lectura no es lo suficientemente veloz estarás pegado al botón de pausa. Eso es porque El Protagonista habla de una manera tan veloz que es casi imposible seguirlo, haciendo la comprensión algo difícil. Pero esa no será la única vez que echaremos el video para atrás, porque también los monólogos de nuestro protagonista están tan llenos de significado que los querremos leer de nuevo. Puede ser increíble, pero cada frase dicha en esta serie es tan llena de significado y resplandece con tanta luz propia que Wikiquote tendría páginas enteras sólo con los diálogos de nuestros personajes… Y no estoy hablando de esas frases baratas que se consiguen en todas las series, las de Tatami Galaxy son todas originales. Hay animes con significado y moral, los hay con personajes divertidos, hay animes con una increíble narración y desarrollo de la historia, pero tengo que decir que The Tatami Galaxy tiene todo esto y más. Yo recomendaría (experiencia personal) ver de nuevo esta serie después de un tiempo. De eso modo nos podemos dar cuenta de la increíble cantidad de particulares que se dejan atrás mientras los estamos viendo por primera vez. Porque, después de todo, mirar de nuevo un anime que nos gustó nos da la posibilidad de apreciar esos pequeños detalles que nos pudimos haber saltado, y en este caso hay bastantes. Me exprese lo mejor que he podido, espero que esta review les ayude a decidiros a dedicar vuestro tiempo en este anime, porque de verdad lo vale. Ahora voy a dejar a ustedes, los lectores, el tiempo de visualizar todo lo que se dijo hasta ahora. Si acaso encuentran a este un poco interesante, les digo que no lo duden y denle una oportunidad, ese es el objetivo principal de esta review. Si no es así, pues no logré trasmitir mis emociones sobre esta gran serie con éxito al ser aún un principiante. En cualquier caso, les agradezco su tiempo. I don't mean to get deep and definitely not right off the bat, but it's pretty true that small events can change the course of your life whether you're aware or not and that is what Yojou-han Shinwa Taikei (or the 4.5 Tatami Mat Galaxy) is all about. Sure it's also about pleasing your Johnny, hijacking blimps, engaging in prank wars, being ripped off by fortune tellers, joining the local power ranger squad, and eating cats and castella, but that's all trivial. Brought to you by the same guy who brought you Mind Game, Cat Soup, and Kaiba, Masaaki Yuasa, brings you what I would like to refer to as his best work yet. A nameless protagonist, referred to as Watashi ('I') by himself, has just entered college, and the story more or less follows his many lives and many misfortunes. Each episode starts with Watashi pursuing something inane or stupid - like a "rose-colored campus life" or "raven-haired maidens" and in each episode his friend Ozu, manages to somehow screw everything up. I say friend in the lightest sense of the term, because Ozu isn't really anyone's friend. He's a backstabbing punk who just loves to terrorize people, and he always manages to infect Watashi in one way or another, usually ending up driving him away from his goal. Along Watashi's trip across the Tatami Galaxy you're introduced to many different people, and in each life, a different story unfolds. Each story is unrelated other than by starting the same way at first glance, but you'll start noticing some patterns, and eventually it brings you to one of the most impressive endings I have ever seen. If I were to tag a genre to this anime I'd first have to say it's a slice-of-life comedy, then mystery, but it's also a really great psychological anime. It's incredibly dialogue heavy, and the first three minutes of episode one has the most text I've ever seen in an anime. That being said it can be very easy to lose track of what is going on, but if you're on your feet then you shouldn't get lost too easily. Yojou-han is brought to you by MadHouse, which is known for it's diverse art style and in this anime's case it is either defined as pretentious or glorious. I would like to call it the latter. It's non-traditional and is unlike any other anime in existence, seriously. It's like Mononoke when Mononoke was new, it can amaze people, or turn people the heck away. It's a very vibrant anime, and everything is so fluid - movement looks just splendid. For those faint of eyes, be wary, Yojou-han Shinwa Taikei may not be the anime for you. Well, there's a song about shapes in an early episode. That was like, totally freaking awesome. How many anime have songs about shapes? Unless Fullmetal Alchemist the Musical is coming out anytime soon, I think that's about a zero other than Yojou-han. The opening is amazing, and Asian Kung-Fu Generation does a great job (It's called "Maigo Inu to Ame no Beat"). I believe it's their first opening for a non-shonen show. The ending is amazingly well positioned (you'll see what I mean) and the first time you hear it I promise you'll get a small shiver. The singer is the same who sang the Arakawa Under the Bridge opening, Etsuko Yakushimaru. The voice acting for every character is of course, awesome as well. Watashi does most of the talking and I was considering favoriting his voice actor (Shintaro Asanuma) just because I liked to hear him talk. The background music is the only flaw sound-wise. There really isn't much to listen to, and even if their is, I probably didn't notice, because between following the dialogue and looking at the art, it's pretty hard to manage a third element. I've already explained who Watashi is, but let me tell you a little more. Watashi likes shortcuts and doesn't like working, and almost can be seen as a lazy Ozu. Ozu is our antagonist most of the time. He's the downright rotten scoundrel who always leads our poor Watashi astray, and usually ends up profiting off of it. I called Watashi a "lazy Ozu" a moment ago because Watashi isn't an innocent little bird, he's just too lazy to put his efforts into anything other than his hobbies. Akashi, the somewhat romantic interest, is a girl who loathes moths and is bluntly cold to everyone around her. Kind of like Senjogahara (from Bakemonogatari), but easier to cope with. She's pretty funny herself, but all the characters are. We have the doll-fanatic Jougasaki, the drunk and elder Hanuki who likes to speak broken engrish, the Master Higuchi, who is an 8th year graduate who plans to travel the world, and multitudes of others (like Watashi's Johnny (see Eden of the East)). The character development is insanely good too. This anime is about Watashi's little foray of self realization, thusly he gets the most character development, but never have I seen it done so well. An anime that can create a macrocosm within itself is an anime to be trifled with. It sets the stage with brilliant characters and visuals, brings hilarious moments throughout, and manages to deliver numerous meaningful messages. Is there a perfect world? Will I be happier with more money and women? Will I be happier doing what people say I should? Yeah. It's pretty damn complex. It's as thought provoking as Kaiba while bringing the comedy of Gintama. I think it's safe to leave it at that. No fanservice, no lolis, no moe, no ultra-violence, no regrets. It's intelligent without being snobby, it's stupid without being idiotic, and it's appealing without being inappropriate. To sum it up, I think you should just try it out. It's only 11 episodes, and I think for the one season range of anime, this is one of the best out there. Destiny is always dangling right in front of you, so why not reach out and grab this anime? Yojouhan Shinwa Taikei (or The Tatami Galaxy) is an anime about a university student stuck in a Groundhog Day-esque time loop. In the span of each episode, our nameless main character (he is referred to as Watashi, basically meaning "myself") goes over the same two years of university, unaware of the loop, each time joining a different club, in search of a "rose-coloured campus life". Yojouhan is a rare example of a series with time loops where the loops themselves are actually played with. Throughout the 11 episodes, there are several different stories, but many of the episodes focus on the same stories as others. What makes these episodes work is that we see the stories from different angles. In some episodes, we see segments of the story that aren't entirely clear, though at the time are not distracting. In later episodes, these plot points are often explained when Watashi's perspective changes and we see what actually happened. The best part of this, though, is that every episode lends pieces to a larger story. While the series is episodic, what we see effectively falls into place like a jigsaw puzzle, all coming to fruition in the final episode making for one of the most satisfying conclusions I've ever seen. As a result of this, the first few episodes of the series don't make complete sense. They come off as being more abstract than part of an actual plot, but as the series goes on the beginning is referred to in a way that makes this start a vital piece of the puzzle. However, the start is hardly a throwaway. While not as strong as the rest of the series upon viewing, the bizarre and abstract style make the beginning an enjoyable watch anyway. On that note, the way the series is presented is part of the genius. Upon starting the show, the first thing that will strike you is undoubtedly the art. The characters are drawn in an oddly cartoony way, using only one-tone colours for the art and having a rubbery kind of movement to them. This seems like an odd choice, but it does help to draw you into the unique world of Yojouhan, and later in the story it even gets used for plot purposes. This is also combined with a lot of black and white live-action shots, wherein the characters are sometimes drawn over the actors. The strange presentation doesn't stop there, though. One strange feature of Yojouhan is that Watashi is very fond of monologuing, in a way very reminiscent of Kyon (from the Haruhi Suzumiya series, in case you've been living under a rock). He does so, however, at a very high speed. If the show has a fault, it is this, but it's more of a double-edged sword than a flaw outright. For people who aren't great at reading, the high speed of the subtitles can often make the things Watashi says hard to keep up with, but it's rarely overwhelming. On the plus side of it, it helps to keep the pacing of Yojouhan fast, which keeps the series interesting, an important factor in a series that is driven with an abundance of dialogue (excellent though the dialogue may be). For a show that could have easily been dull or just weird if it had been handled wrongly, it only makes sense that even more precautions are made to make sure that there isn't a dull second in Yojouhan, as evidenced by the motormouthed narration. What helps with this is that rather than being thrown into an entirely new plot every time, there are a few elements that remain the same throughout every story. The beginning and end of each episode are usually the same, as well as Watashi's meeting with a fortune teller. This helps the viewer to keep a pace with the series, which may have been otherwise hard to do. The characters of Yojouhan aren't really the focus point, but they aren't an afterthought by any means. While each member of the cast is a vibrant and distinctive individual in of themselves, the actual characterisation isn't really the strong point of the characters, but rather how they are used. Just like the story, each character and their actions throughout the two years are explained slightly more with each new perspective. This ends with more or less every character coming out good, but one character in particular sticks out as being an excellent example of defied expectations, showing their nature as a 3-dimensional character as we see their story from each side fall into place. I won't spoil who it is, but anybody who has seen the series should know who I mean. Watashi himself, while an unremarkable person, is hard not to like for his enjoyable musings and relatable situations, and as the series goes on he does develop well, if not remarkably so. Of course, the time loops persist for as long as Watashi continues to miss the proper way to live the two years, with conclusions that have been dangling in front of his eyes the whole time. Some of the conclusions become expected after a mere few episodes, but other, more important ones (as well as the entire point of the time loops) are less obvious and yet no less excellent. Yojouhan Shinwa Taikei is an exercise in series structure unlike anything before it. The way the entire series is built comes off as nothing short of genius. I have yet to see any of acclaimed director Yuasa Masaki's previous works, but Yojouhan makes it blatantly clear that he lives up to the reputation that precedes him. I can only hope Kaiba, Kemonozume and Mind Game are nearly as good as this, because now Masaki has set an excellent example of how to make a truly great, original anime. For Fans Of: Bakemonogatari, Welcome to the N.H.K! I think I'm not in the wrong here when I say most of us have probably thought of the best way to live life at one time or another. That can mean what you want to be when you grow up, your dreams, ambitions, goals, what path you want to take, and what you envision it ending up life. Tatami Galaxy's unnamed protagonist is one concerned with exactly that. In seek of that ideal life, he desperately repeats the first 2 years of his college life , searching for the "rose-colored campus life", and the "raven-haired maiden" that supposedly awaits him. In doing so, he is able to realize the complexity of humans, himself, what he really wants, and what it means to live life. It's very clear that this show is leashed to a strong central theme from the start, as the episodes repeat themselves over and over to drive its point home, and make the cathartic end that it builds up to all the more resonant. Art-wise, I think it's probably director Masaaki Yuasa's best piece, or at least my favorite of his. This is a show that can flash through 3 or 4 art styles in just a few seconds. Vibrant, volatile, and ever-changing with the moods, the visual direction seems to me like a reflection of the volatility of life itself. Something's always on the screen there to catch your eye. The use of real life shots is funny, as this is probably one of the wackiest yet most relatable shows I have ever found myself watching. I see quite a few people that often say this show is "deep" or whatnot. Well, maybe. I don't really agree, actually. There's plenty of people out there that drop this show without getting to the end, and they do mark it off as a "2deep4u" show. Honestly, they might just be a little less intelligent than the rest of us, because the idea behind Tatami Galaxy seems to be something very simple to me. Stop caring about the best way to live life, because you WILL lose yourself in pursuit of that "rose-colored campus life". In fact, you may have already found that fulfilling life already, but haven't realized it. From there on, all you've got to do is enjoy the ride.